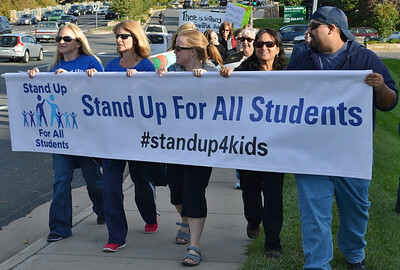 Protesters carry banner "Stand Up For All Students", other demonstrators marching behind them. 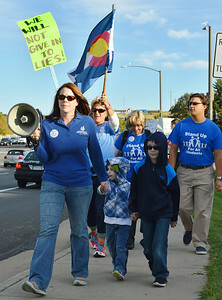 Woman holding hands with two children carries bullhorn at school board protest, other behind them with signs and Colorado state flag. 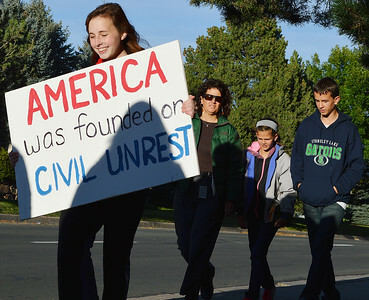 Young girl smiling while marching at school board protest carries sign "America Was Founded On Civil Unrest". 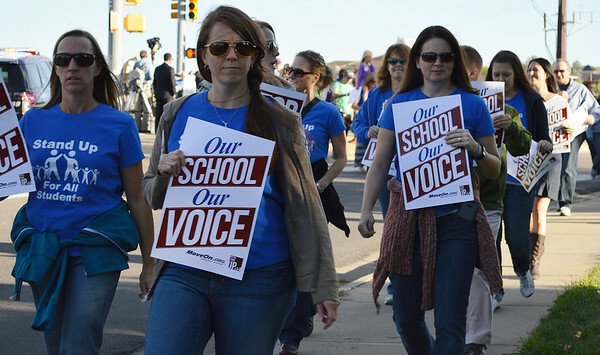 Group of women marching with "Our School Our Voice" signs other protesters marching in background. Woman in school baord protest march raises sign above head, other demonstrators with signs around her. 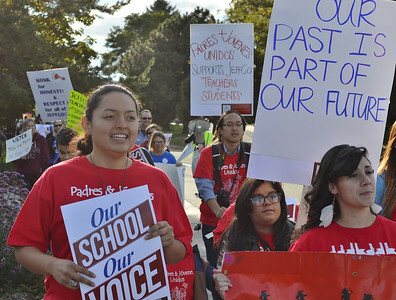 Young boy running carries sign about censoring history, young girl wearing t-shirt that says "Stand Up For All Students, two women march with them. 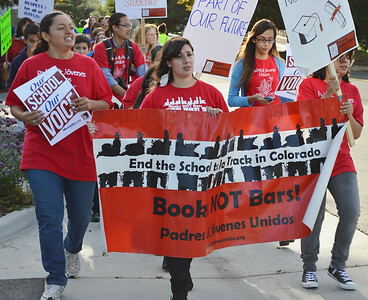 High school students carry banner "Books Not Bombs", other protester with signs marching in the background. 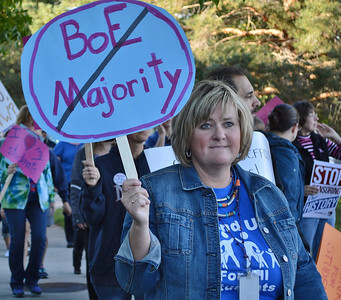 Woman marching with "Our School Our Voice sign, behind her man carries sign about extremists and schools. 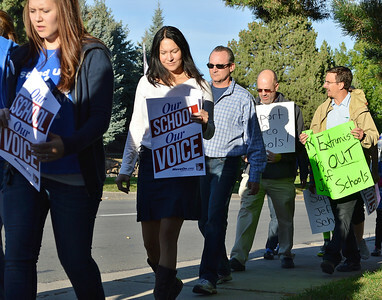 Line of marchers at school board protest carrying signs. 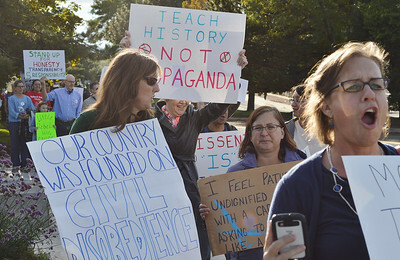 Woman carries sign about censoring history, other woman behind her, a teacher, raises sign above head about kids, other protesres marching behind them. 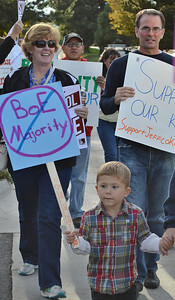 Young boy marching in school board protest with sign, other demonstrators behind him. 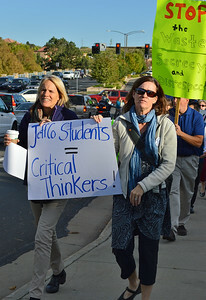 Two women carry sign about students and critical thinking, other protesters with sign marching behind them. 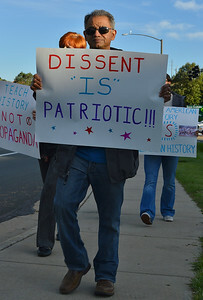 Man marching with sign "Dissent Is Patriotic", other protesters behind him. 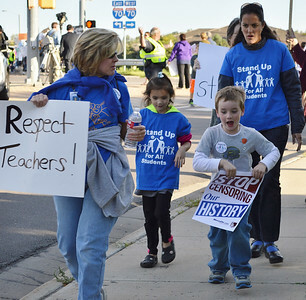 Man at school board protest carries young child, young girl next to him, other marchers with signs behind them. 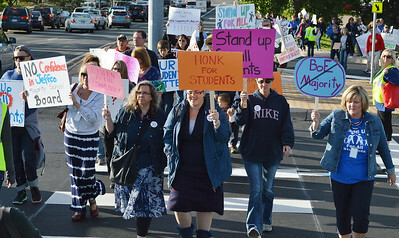 Large group group of women with signs at head of school board protest march, other demonstrators in background, all in crosswalk at intersection. Young boy waving to onlookers as he marches with sign about censoring history, other demonstrators with signs behind him. 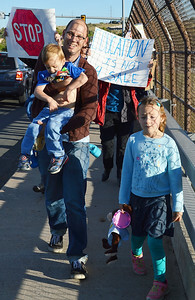 Young Asian-American boy carries sign about censoring history, behind man pushing child in stroller. 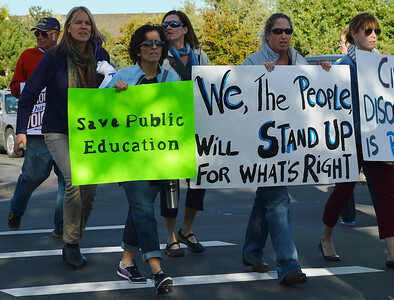 Protesters with signs about public education marching side by side. 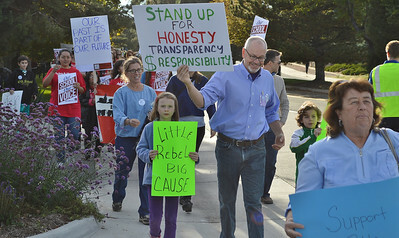 Young girl with "little rebel, big cause" sign marching next to father, other protesters in background carry signs at school baord protest. 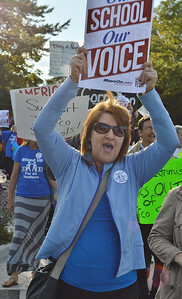 Woman shouting, other protesters in background with signs about history and civil disobedience. 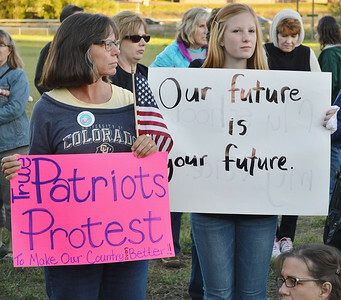 Young women, high school students, marching in school protest, protesters in background carry signs. 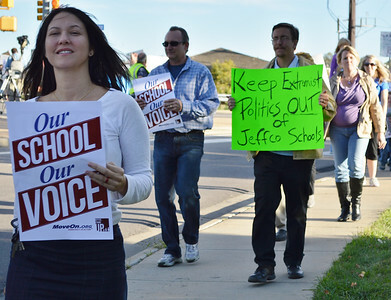 Two women carry signs at school board protest, other demonstrators marching behind them. 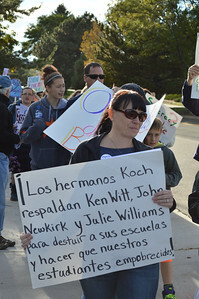 Woman marching in school board protest carries sign in Spanish, other demonstrators in background. Woman at school board protest raising sign above head and shouting, other demonstrators with signs behind her. 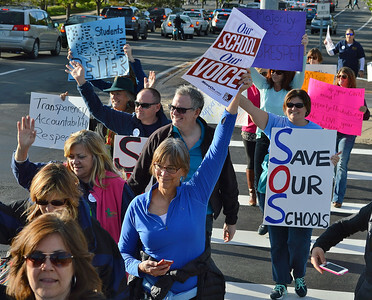 Two women holding signs "Our School Our Voice", other protesters with signs behind them, all standing on side walk next to street. 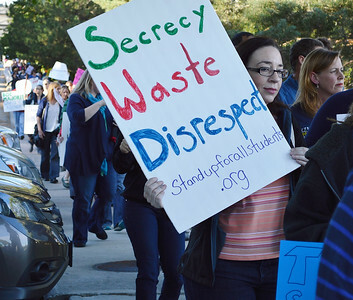 Woman at school board protest with sign "Secrecy, Waste, Disrespect" long line of demonstrators in background. 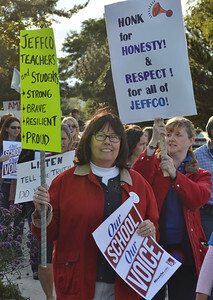 Woman holding sign at school board protest, other demonstrators in background. 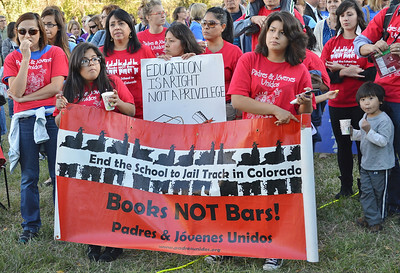 Group of women wearing "Padres & Jovenes Unidos" t-shirts holing banner "Books Not Bombs", other protesters with t-shirts standing behind them. 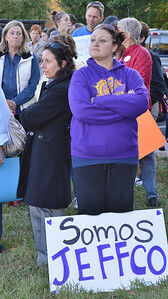 Two women standing with signs at school board protest, one sign in Spanish. 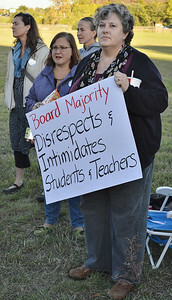 Woman at school board protest holding sign "Board Majority Disrespects & Intimidates Students & Teachers". 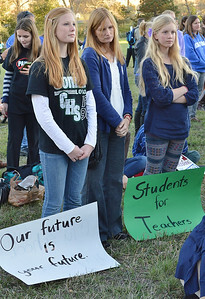 Mother and two daughters standing together at school board protest, signs at their feet. 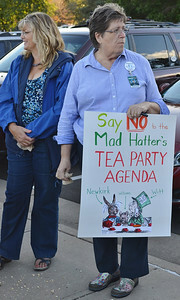 Woman at school board protest holding sign about Mad Hatter and Tea Party agenda. 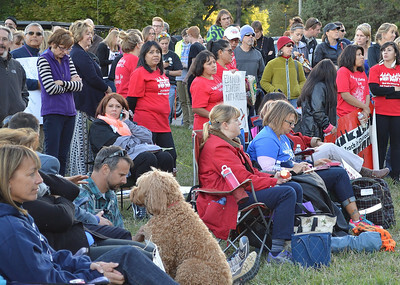 Large group of protesters listen to school board meeting, some sitting, some standing. 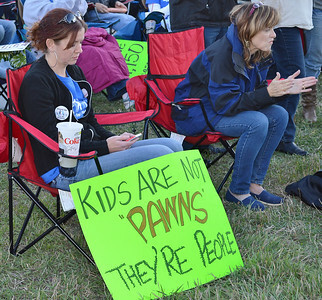 Two women aitting in chairs at school board protest, one clapping, other looks at cell phone, sign at her feet "Kids Are Not Pawns They're People". 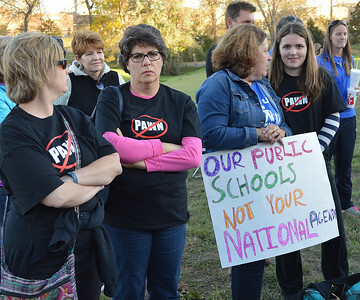 Group of women at school board protest wearing "not a pawn" t-shirts, one holds sign about public schools. 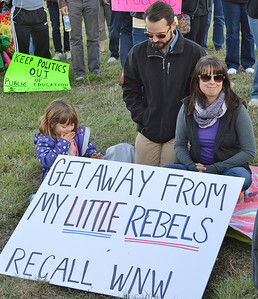 Parents sitting on ground with young daughter at school board protest, sign in front of them about recalling school board. 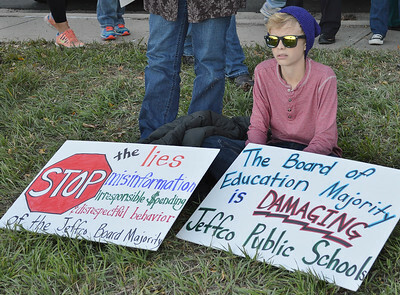 Young boy wearing sunglasses at school board protest sitting on ground with signs about school board lies and misinformation. 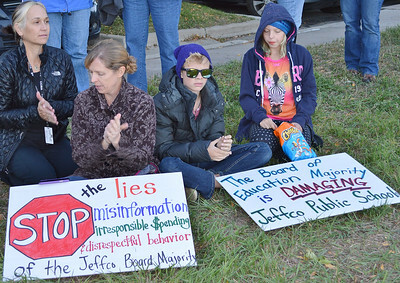 Two women and two children sitting on ground at school board protest signs about lies and misinformation at their feet. 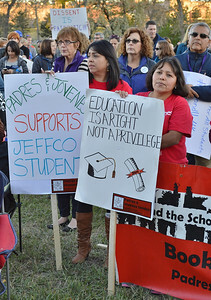 Two women at school board protest holding signs about students and the right to an education. 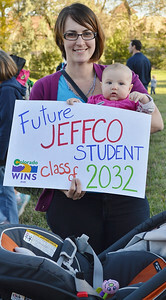 Woman at school board protest holding infant and sign "Future Jeffco Student Class of 2032". 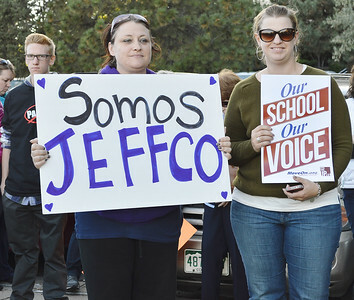 Woman at school board protest standing with arms folded, "Somos Jeffco" sign at her feet. Senior woman at school board protest, sign at her feet about civil disobedience and protest.